Set Paths and Templates are stored with the current Project and will be restored to it once you open the project, so you only need to configure each project once - no need to relaunch 'Set Project Paths again ! each project path to this saved path by clicking the Reset to Default button. are preset on load of Set Project Paths dialog however they will only be applied once you confirm with the 'Set Project' Button. To see the currently set path or template for a setting, turn the setting off. Its now deactivated path field will display the current path. This can also be used as a way to reset not yet applied path or template changes to its default by deactivating and reactivating the setting. Base Path allows you to enter a root path for your project. defined Base Path once you confirm the dialog or deactivate the setting's 'Relative to Base' Checkbox. 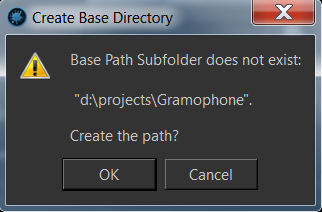 The 'Base Path' Field supports entering Subfolders that don't exist yet. An enabled setting will cause a change to the setting once the Project Paths dialog is confirmed. A disabled setting will not change any path when the Project Paths dialog is confirmed. A disabled setting will show the current path set for the project in its deactivated 'Settings path' field. to the 'Settings Path' field. The 'Settings Path' Field supports entering subfolders that do not exist. you might have made by using the Set Project Paths tool. in the Path Field will be fully expanded to the full path defined under the 'Base Path'. The Path field will no longer be relative to the Base path until you turn 'Relative to Base' on again. 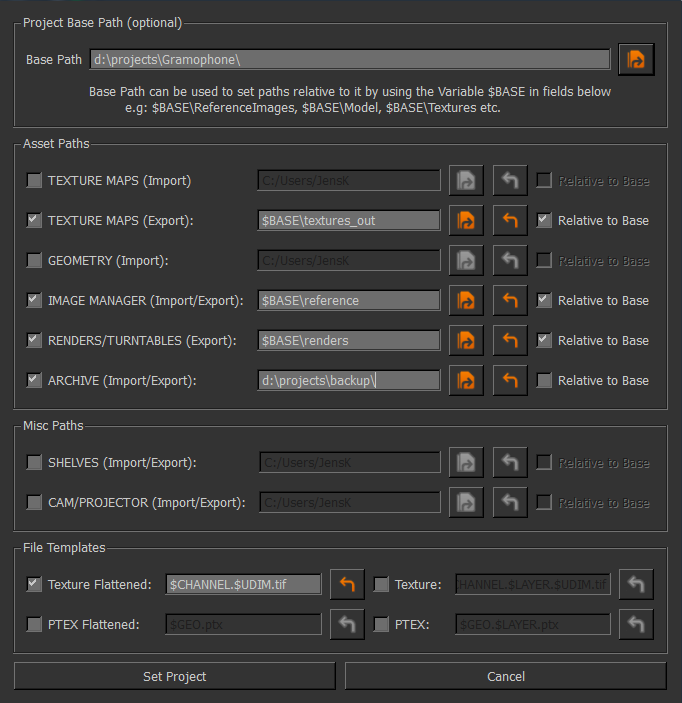 File Templates allow you to configure default file templates & file extensions for different types of texture exports. Subfolders are supported for these fields as well. on export Mari will autocreate a subfolder named after your channel and place the exported files into that subfolder.